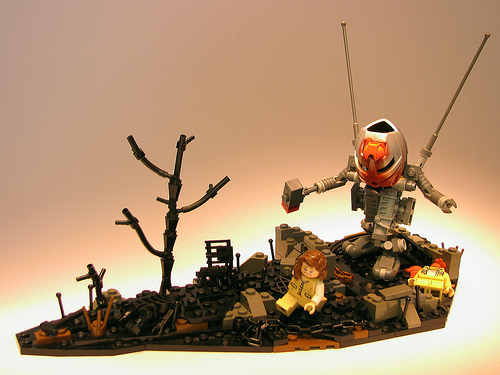 Brian Kescenovitz (mondayn00dle) is another builder who probably has more works featured on our blog than not. What makes this creation unique is the combination of an emotionally arousing scene and backstory (yes, a Lego creation can be more than eye-candy). The rust stains on the rare Bionicle mask of the hardsuit mirrors the stains of blood and adds to the twisted setting. The hardsuit also seats a complete minifig. I love the shape of this vig. Excellent burned out wasteland in a small package. That mask isn’t rare, btw. Still an awesome creation, just thought I’d clarify that.